Degradation is easy to see using control charts. MassQC's control charts can show an instrument is degrading over time. In this way MassQC can indicate when maintenance is due or a part needs replacing. 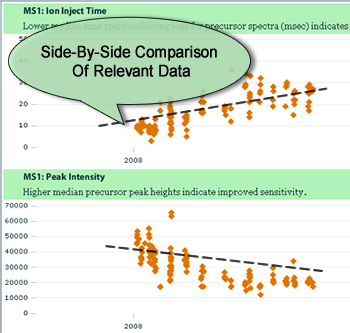 These control charts show a general decrease in the MS signal received by the mass spectrometer in the MS1 scan over a period of several months. The control chart for the Ion Inject Time, a metric that measures the time to fill the ion trap, shows a clear trend upward. The conclusion that there is a decrease in MS signal is supported by the downward trend of Peak Intensity over the same time period. 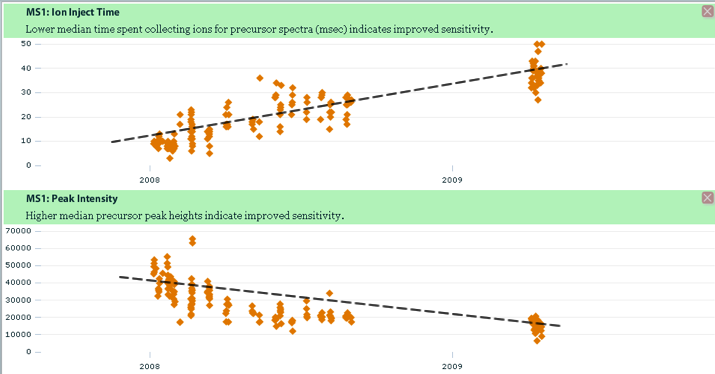 This decrease in MS signal is likely showing the effects of an aging electron multiplier over the period of several months. Normal wear and tear causes a decrease in its sensitivity and means this part needs to be replaced relatively frequently. Do we need to schedule maintenance today, in a month, or in two months? Are there some samples in the queue that shouldn't be run because of this issue? Or, for our kind of samples, this is nothing to worry about?